Located at the prestigious Royal Westmoreland Golf Resort around nine minutes' drive from Holetown, Sweet Spot is a delightful five-bedroom villa in one of Barbados' most exclusive areas. 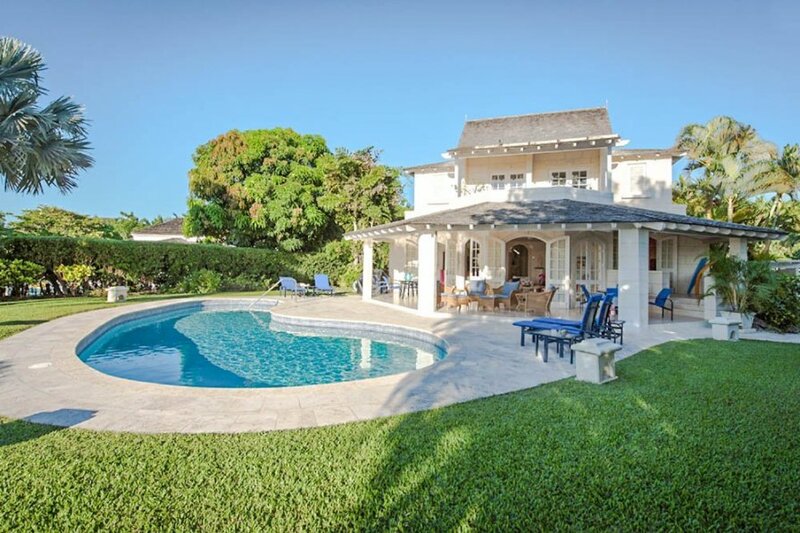 Located at the prestigious Royal Westmoreland Golf Resort around nine minutes' drive from Holetown, Sweet Spot is a delightful five-bedroom villa in one of Barbados' most exclusive areas. You will have all the amenities of the resort at your disposal when you stay at Sweet Spot, including a gym, flood-lit tennis courts and a wellness centre, plus your own private pool right outside your door. The coast of Saint James is lined with irresistible beaches, and the golf resort has its own private beach club at one of them, Mullins Beach. A complimentary shuttle will take you there, where your sun lounger and parasol await. If you prefer, you can spend the day on the villa's own charming pool terrace, with its peaceful covered dining and seating areas. From here, you have direct access to the open-plan living area inside, providing a light and airy seating area which flows through to a colourful dining space. The kitchen is just steps away – very spacious, it has all the appliances you could need and is kept cool and comfy with a ceiling fan and large windows. All of the impressively-proportioned bedrooms are equipped with air-conditioning, safe and Smart television, and each has its own en-suite bathroom. You will find king, queen and twin rooms in the main house, while the remaining two bedrooms are located in a separate cottage. Perfect for a small family wanting some extra privacy, this cottage has a queen-size bed in one bedroom and twin beds in the other. As well as all the facilities of the resort, Sweet Spot benefits from its proximity to two of the west coast's main towns. Both approximately 10 minutes away, Holetown and Speightstown complement each other well – Holetown is great for nightlife, luxury shopping and entertainment, while Speightstown has a calmer vibe and a fascinating history to uncover, as well as some suitably chilled-out eateries. Sweet Spot is like a pretty jewel box near the sea, that can sleep up to 10-guests. This holiday home has a huge lawn area, just momwnts from Royal Westmoreland facilities.